Like any craftsman, an athletic field groundskeeper relies heavily upon the tools he or she uses to hone their craft of maintaining ballfields. From basic tools like rakes and shovels to the more specialized tools like a level board or slope gauge, groundskeepers use a wide range of hand tools to accomplish their work with a varying attention to detail. You probably have ideas of what some of these tools are used for. You may or may not be right. 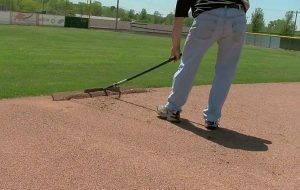 A seasoned groundskeeper will likely show you several other ways he or she has used that tool for groundskeeping tasks. In this introductory module we take a look at some of the tools of the groundskeeper’s trade. Because these tools will be used in later modules, we’ll get you familiar with their names, their application, and their care.